2013 Update: Not sure when these disappeared, but I doubt anyone will miss them. Funny how this line up changed. At one point, this "premium" low fat ice cream had catchy pint names like happy together, chocolate cherry mambo, in the beginning, brownie bliss, and double karma. There were half gallon offerings like rocky road, tin roof sundae, chocolate chocolate chunk, cappuccino chocolate chunk, coffee almond fudge (nsa), peanut butter cup, cookies 'n cream, praline & caramel, mint chocolate chip (nsa), and cherry vanilla. Eventually they moved on to the branding you see below with flavors like vanilla, belgian chocolate, and pomegranate blueberry. I'll admit I was confused when I saw the simple green pint of Hea!thy Choice Ice Cream sitting there on the freezer shelf ...especially if you consider the fact I was in Walgreens - you know Walgreens, the pharmacy where they don't bother to label the doors "entrance" or "exit" so you always wind up walking into someone. 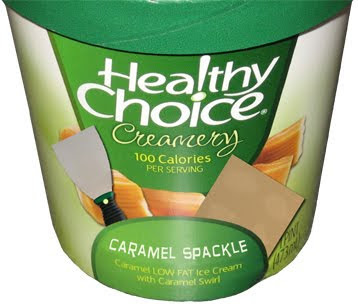 Funny, I've never seen Healthy Choice ice cream containers before. I definitely didn't see them at the other Walgreens, though the one I went to today is newer and larger than the other one I typically go to. 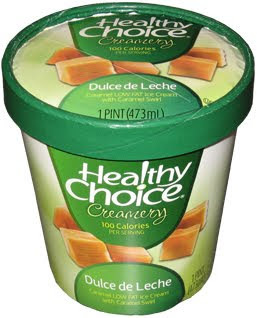 I was thinking these were new since I don't see them on the Healthy Choice website, but I did some searching and they started making Healthy Choice ice cream waaaaaaay back in 2002 (the flavors I saw today do not line up with the flavors listed in that article though). Before me sat a half dozen Healthy Choice flavors to choose from, but since the old heartburn is still bugging me a bit, I avoided the dark Belgian chocolate flavor and opted for the Dulce de Leche : Caramel LOW FAT Ice Cream with Caramel Swirl. I plunked down my $3.99 and headed back to work. Ok, $3.99 buys us a plastic seal on the top which is always appreciated, but after I remove it, it still looks kinda freezer burned. Closer inspections reveals that it's not so much freezer burn but just a really odd texture. It reminds me a lot of Brigham's attempt at a light ice cream: light Caramel Brownie . Except for the brownie chunks, that ice cream was immensely boring. I hope this one is better. I take my first bite, and then another - and I am bored already! What uninspiring, funny looking ice cream I have wasted my money on. The flavor is just so blah, boring, blechy. The only redeeming factor here is the fat content. This whole pint only has 2 grams of saturated fat. I can eat the whole container and only consume 400 calories, 20 of which come from fat. HAHAHA, as the "ice cream" melts before me, all the air is escaping ...actually it's pretty disturbing and looks like my poor dessert has rabies and is foaming at the mouth ...GRRRRRRR.... at least I'm not trapped in a Ford Pinto with it. hehehe, I just swirled up the rest of it and it looks like cream cheese frosting. It's real shiny looking now. Oh man is that unappealing. Real ice cream melts, but this is breaking down right before my eyes and it's not even that hot in here. I'm trying hard not to be overly critical here, but I look at this stuff and feel like I should go spackle a few holes with it. It's just that bizarre. I'm pretty sure I would like my $3.99 back now, yet my satisfaction has not been guaranteed. very low fat yet unamusing caramel spackle masquerading as a frozen dairy dessert. Time to wash it all down with some pretzels. ***weird, how often do you see "sugar alcohol" in the nutrition facts? That is interesting - I remember it from years ago. I'd be curious to know how old those containers really are, or if they're trying to re-introduce the line. Sorry your experience was bad - but thanks for all of your reviews! I'm almost positive that this is a reintroduction. Not only do we have new containers (copyright 2008) to match the new Healthy Choice branding (no more dark green boxes), but there is a new set of flavors different than the original. I feel like I should try another flavor, but I'm afraid! What a shame. I tend to enjoy Healthy Choice frozen desserts but sounds like this was a complete misfire. HORRIBLE PRODUCT... DO NOT BUY IT...IF YOU DO FIGHT TO GET YOUR MONEY BACK. I just tried to eat the vanilla version. The "ice cream" is loaded with grit. Very weird. It is like sand or sawdust fell into the mixer during production. How did this get past taste testers or quality control? There are comments here about Healthy Choice Creamery ice cream from 2009. How could this sand-paper flavored stuff have been on the market for a year. Fiber content says 0 grams. It should say 95% fiber. At least that is how it tastes. I liked the ice cream. The texture is weird, I'll grant you that (especially if you go with one of the pomegranate versions). The trade off though when it comes to calories and fat is worth it to me. And as far as sugar alcohol, pretty much any food where they are trying to claim low sugar or "sugar free" usually lists sugar alcohol. Check out all the diabetic crap out there and you'll see it. This is all probably a moot point though. Seems like this ice cream is dying off. I can't find anything other than vanilla or mocha. I love the vanilla. I wish I could find more flavors. Whatever happened to the half gallon options?